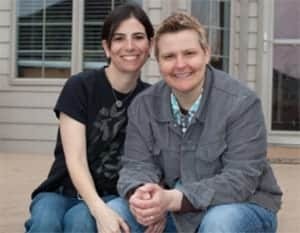 Lambda Legal has filed an emergency motion with the U.S. 7th Circuit Court of Appeals asking the court to recognize the marriage of Niki Quasney and Amy Sandler while it considers District Judge Richard L. Young’s ruling striking down Indiana’s ban on gay marriage because Niki is currently battling Stage IV ovarian cancer. The emergency relief granted by the trial court is no longer in effect; the stay issued by the Appeals Court last week applies even to couples facing terminal illness, who may not live to see the conclusion of the State’s appeal. Baskin v. Bogan was filed on March 10, 2014 in the United States District Court in the Southern District of Indiana. Lambda Legal later filed a motion seeking immediate relief for Ms. Quasney, Ms. Sandler and their two children ages 3 and 1. Almost five years ago, Ms. Quasney was diagnosed with stage four ovarian cancer, having more than 100 tumors removed surgically in 2009, and has since gone through years of chemotherapy. They have a civil union in Illinois and were married in Massachusetts in 2013 but need their marriage legally recognized in Indiana to receive the full protections that every other married family in Indiana receives. Previously, a gay Ohio couple’s marriage was recognized by a federal judge as one of the partners was battling terminal illness.